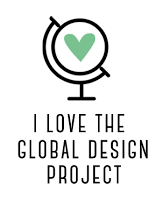 Well, the workshop for which I am prepping is going to be pretty large, so all my designs have to be based on whether or not I have enough materials to make them. My hostess loves the Adventure Bound Designer Series Paper Stack and wanted a card made using that series, but it takes quite a few of the stacks to have enough paper for a large workshop. 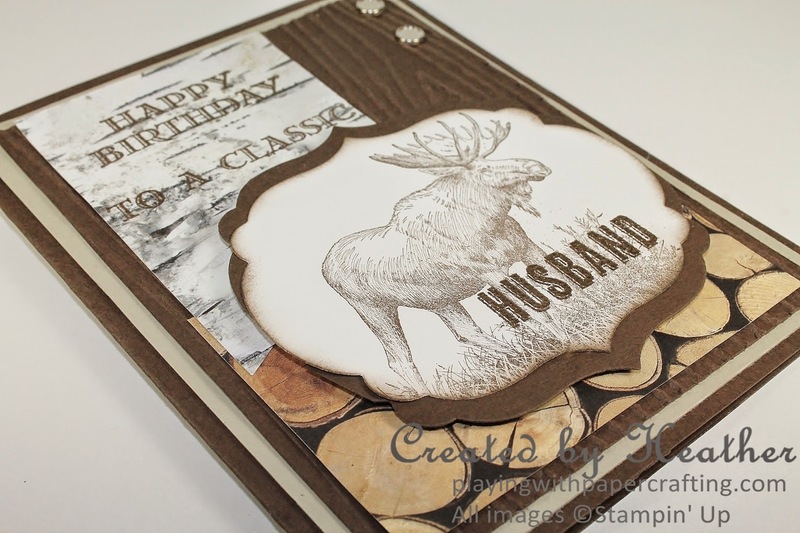 By using smaller pieces I was able to make this design work and I paired it with the Walk in the Wild Stamp Set and some embossing with Early Espresso Stampin' Emboss Powder! I just love the Birch Bark design. It looks so three dimensional, it almost feels like I could grab an edge and peel some off! 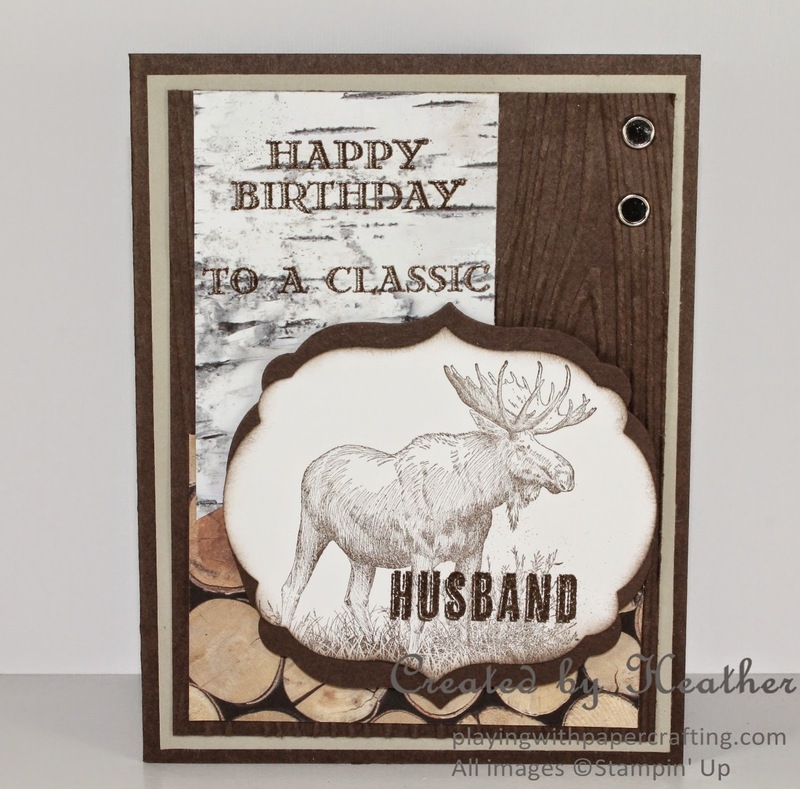 Mounted just over the woodpile design, gives it a nice, rugged look perfect for a masculine card. I looked through the Guy Greetings stamp set for a masculine image that would work with the paper, but nothing looked right, so I got out my favourite moose stamp from Walk in the Wild and stamped him in Early Espresso Ink. He is die cut using the Labels Collection Framelit Dies and I die cut another the same size from Early Espresso cardstock, cut it in half horizontally and mounted them a little offset, behind the moose. When you do that, you might have to trim the sides close to the Whisper White so you can't see the gap. 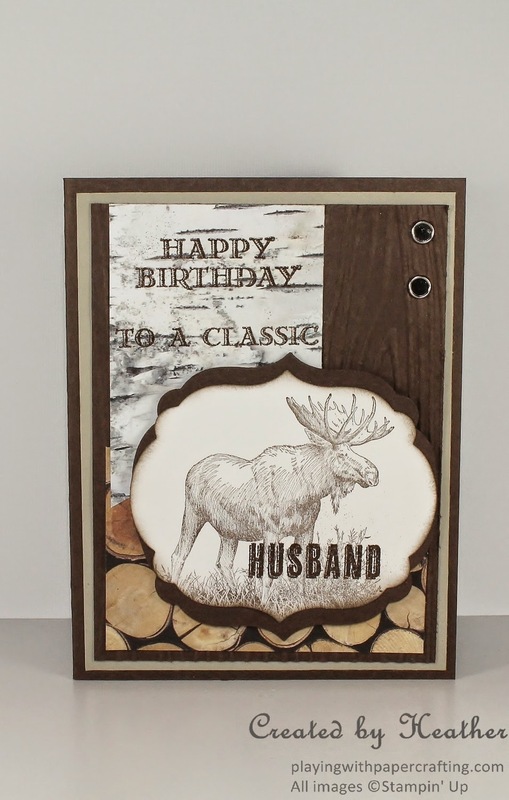 The edges of the moose label are also sponged with Early Espresso ink and the word Husband from Guy Greetings is embossed with Early Espresso Stampin' Emboss Powder. The background panel is dry embossed with the Woodgrain Embossing Folder and the two brads at the top are the Candy Dot Bases. 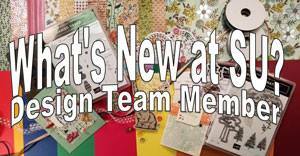 I used the Stampin' Pierce Mat and Paper Piercing Tool to pierce the paper for the brads. I love making masculine cards, and I hope you'll try this design for the guys in your life. Guy Greetings has words you can use instead of Husband, such as Uncle, Grandpa, Dad, Father and Brother, so you have a whole range of family for whom you could make this card. 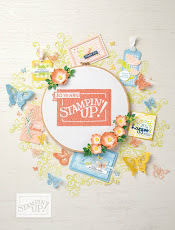 There is one more piece of news from Stampin' Up! 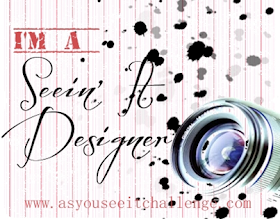 that I need to share with you and it is particularly for those of you who use our digital design program, My Digital Studio. 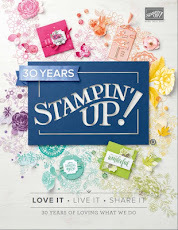 This program has not developed as Stampin' Up! had hoped and will be discontinued as of May 31, 2015. There will no longer be support for this platform after that date and you will no longer be able to purchase any digital content. There will not be any print services available as well. You may continue to use the program as before, and have it printed elsewhere, but if there are any digital images you wish to download, you need to purchase and download them before May 31 of this year. This is sad news for many, but I wanted you to know so that you could get anything you needed before it was too late. Fantastic masculine card! Love all the layers and texture! Thanks so much, Mona! I adore your steampunk owls!! I need to learn some of your techniques!